A bronze sculpture "Healing Hands " commemorates Thomas Ambrose Bowen, pioneer of the Bowen technique an alternative therapy for the treatment of muscular skeletal and neurological disorders. It was unveiled in 2002, the 20th anniversary of his death. Thomas Ambrose Bowen (1916-1982) began developing his technique in the 1950s in Geelong, Australia. He became interested in ways to alleviate human suffering and began to notice that certain moves on the body had particular effects. Tom Bowen developed his technique without having previous formal training in any modality or discipline. In fact, he frequently stated that his work was 'a gift from God'. He continued to develop and refine the technique throughout his lifetime with the help of his friend and secretary, Rene Horwood. Mr. Bowen was extremely busy in his Geelong clinic, performing about 13,000 treatments a year. This was verified by the 1975 Victorian govern­ment inquiry into alternative health care professionals. Considering treatments were seven days apart and most people needed only one to three treatments, an amazing number of clients passed through the clinic and benefited from his gift. Mr. Bowen also held free clinics for children, people with disabilities, and community service workers. This was the guiding belief of Tom Bowen, a humble man who worked tirelessly to help others. Beginning in Autumn Street in the late 1950s, Bowen developed an innovative manual therapy for the treatment of musculoskeletal and neurological disorders. Throughout his 26 years of service to the community, Bowen regularly performed around 250 treatments per week. Together with his good friend Irene (Rene) Horwood (1908-2001) Bowen helped improve the quality of life for many thosands of people. Tom and Rene had a special affinity towards children with disabilities, whom they always treated free of charge at the regular Saturday morning clinics. Bowens' technique has been passed down through his students: it is now taught throughout the world . The legacy of Tom Bowen lives on through the gift he gave us all. 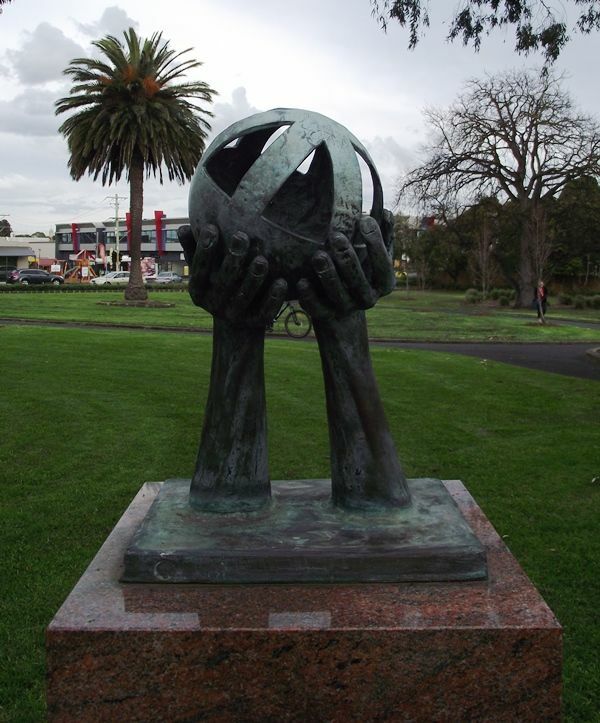 The bronze sculpture depicts two hands holding a sphere. The hands represent Tom Bowen's healing hands, open and giving. The open sphere symbolises the resting head of the client and the worldwide acceptance and practice of the technique. The six shapes created within the half sphere represent the students Tom affectionately called his Boys.